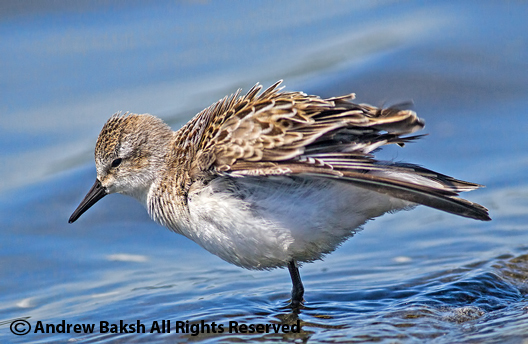 Continuing my posts on shorebirds of Jamaica Bay, today's post features the White-rumped Sandpiper, one of our long winged peep. This is a bird that in the past and especially this summer I noticed many birders (experienced ones at that) on the East Pond at Jamaica Bay having a tough time nailing down the ID; I found this was especially so, when presented with a number of attenuated looking Semipalmated Sandpipers. Keeping in mind, there are those birds that are always going to give even the most experienced and careful birder problems due to features that fail to match up to what a given species is supposed to look like. There are several key field marks that birders should carefully use from the many literature in field guides. In addition, often overlooked clues include structure and behavior. This, is the type of "critical thinking" birding that requires patience. Focusing on behavior and structure - A couple of things to look for include the behavior, where WRSA, tend to wander out further into water than the smaller peeps. If you look at their feeding posture, White-rumped Sandpipers, tend to tilt forward as they feed and from a distance (easier seen) a careful observer will note the crossed wings a feature that the long winged peeps have and a distinctive field mark that could suggest either White-rumped Sandpiper or Baird's the other long winged peep. 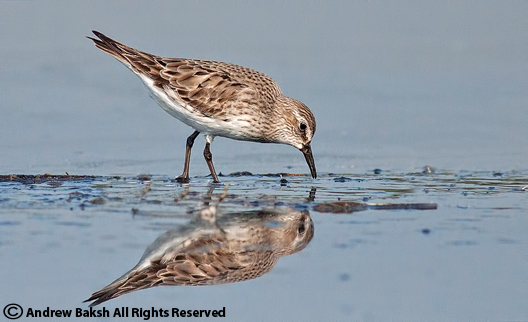 Review your field guides for other field marks to look for in identifying White-rumped Sandpiper. 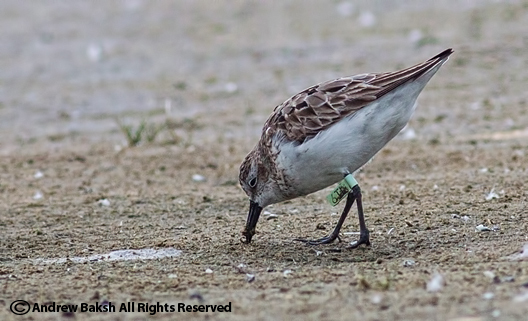 Note: that a very chubby or fattened White-rumped Sandpiper, may not have that attenuated look, so work the bird carefully making sure it passes all the field tests before making the call. 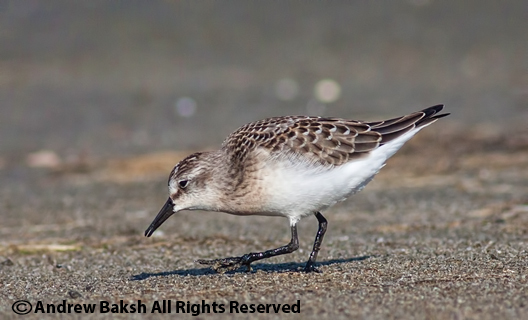 Here are a few photos of White-rumped Sandpiper in different plumage. For my faithful readers who attended the Shorebird Festival on Saturday at Jamaica Bay Wildlife Refuge in Queens NY. This one is dedicated to you and it is an easy one to whet your appetite. Apply some of what you learned from Kevin Karlson's presentation and the in field experience you gained while learning from the several excellent leaders. Good luck and remember to write in your comments and do not e-mail them to me. E-mailed comments will not be acknowledged. I want you to get over the fear of trying! Go for it and don't worry about not getting it right. 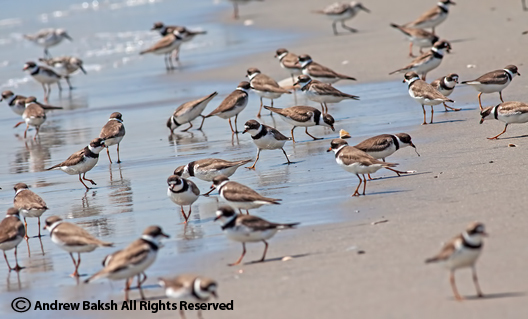 Now to the fine print: Name and count by species all of the shorebird species in the image below. Hint: The photo was taken on the East Pond of Jamaica Bay Wildlife Refuge. 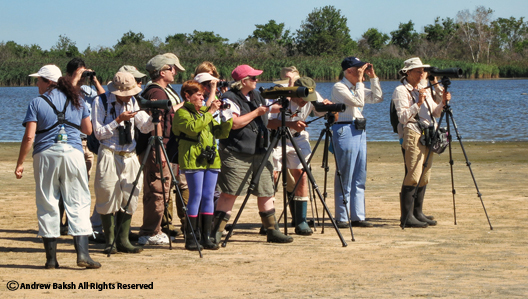 Birders on the North End of the East Pond at Jamaica Bay Wildlife Refuge. 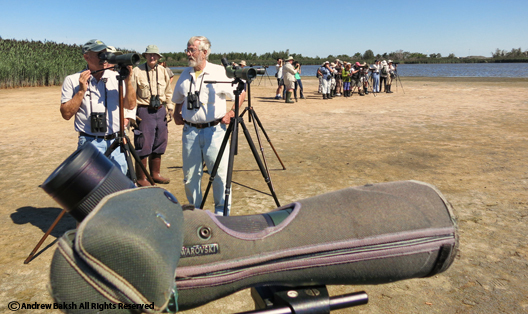 We had excellent weather for today's annual Jamaica Bay Shorebird Festival, which took place at the Jamaica Bay Wildlife Refuge in Queens NY. 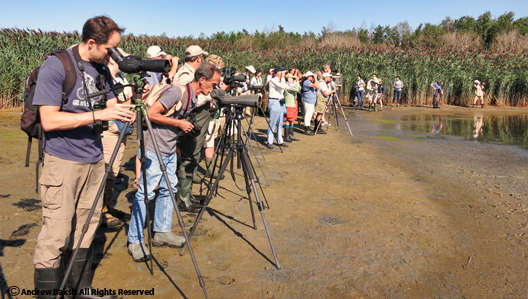 After having free donuts and coffee, participants attended a brief presentation by Don Riepe of the American Littoral Society and then the first shorebird walk took place on the East Pond. I had scouted the pond earlier and my highlights were WHITE-RUMPED SANDPIPER(6), and a SOLITARY SANDPIPER among all the other usual shorebirds for this time of the year. Unfortunately, the AMERICAN AVOCET was not seen today. I helped to lead on one of the walks on the North End of the East Pond, which included the following leaders: Kevin Karlson (co author of the Shorebird Guide and renowned photographer ), Lloyd Spitalnik ( author and renowned photographer), Tom Burke (aka Mr. Tireless and one of the sharpest birders I know) and Peter Post (my apologies, if I missed anyone). While there were not a lot of birds to look at, we added juvenile STILT SANDPIPERS and RED KNOTS (2 of them juveniles) as part of our overall highlights. 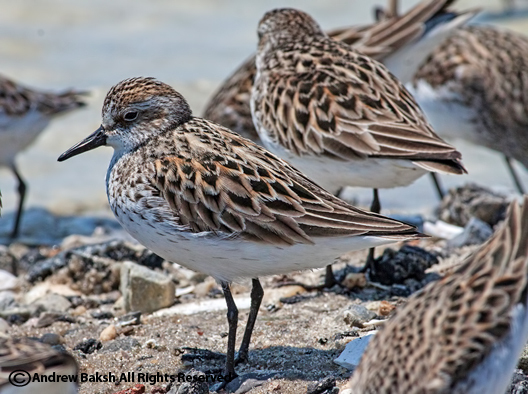 Lloyd Spitalnik's photography presentation and Kevin's talk on shorebird ID takes place later this afternoon, so head on over if you can, it is sure to be good! Kevin Karlson (3rd from right) discusses some of the finer point on shorebirding. Tom Burke (left) one of the Shorebird Festival leaders with the talented and affable Guy Tudor. 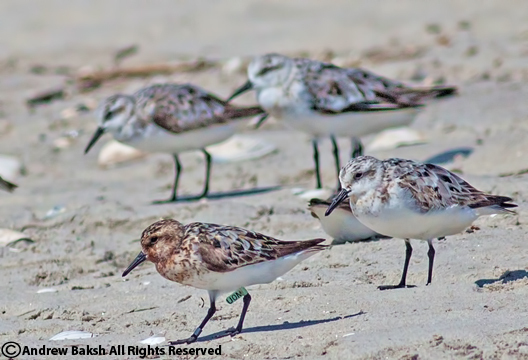 As we hit the peak migration for shorebirds. 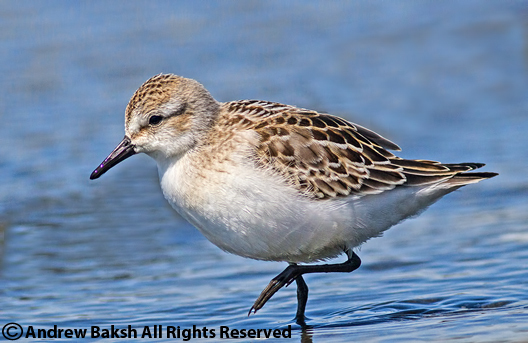 I will everyday, feature a shorebird that can be seen at Jamaica Bay Wildlife Refuge. Today's bird is an abundant one for our area. 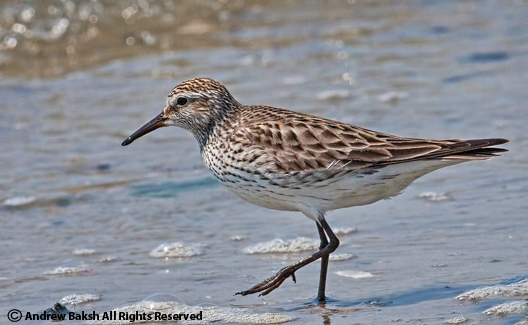 Earlier in the season we see thousands of them - SEMIPALMATED SANDPIPER (Calidris pusilla). 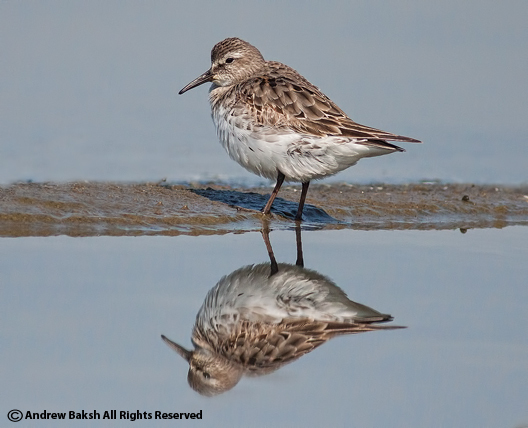 One of the early shorebirds to arrive during the fall migration, the SEMIPALMATED SANDPIPER breeds in the Arctic and winters along the coasts of South America. If I have the photos available, I will try and post the subject in Breeding, Molting (partial) and Juvenile plumage. 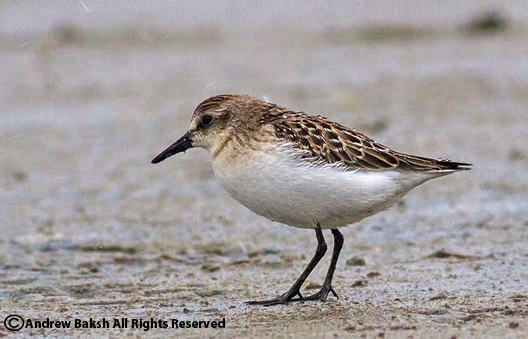 Photographed in Queens NY May 2013, this photo is of a SEMIPALMATED SANDPIPER in breeding plumage. 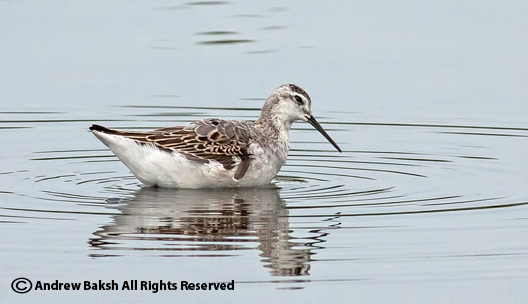 The next photo shows an adult Semipalmated Sandpiper photographed at Jamaica Bay on the East Pond on August 18th 2013. The plumage on this bird is worn and some scapular feathers are already being replaced as some molting is taking place. Note, that the molt is not completed until the bird reaches its wintering ground. 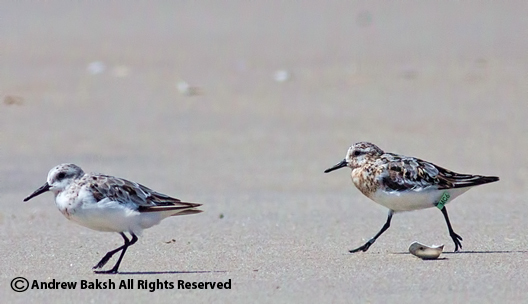 The following photos show a couple of juvenile SEMIPALMATED SANDPIPERS. Note the fresh feathers and buffy look on the young birds. But take a look at the the second image of the juvenile. Can you see the difference? The second bird although a juvenile looks to be more worn than the first bird. Both birds were photographed in August of 2013 about a week apart. 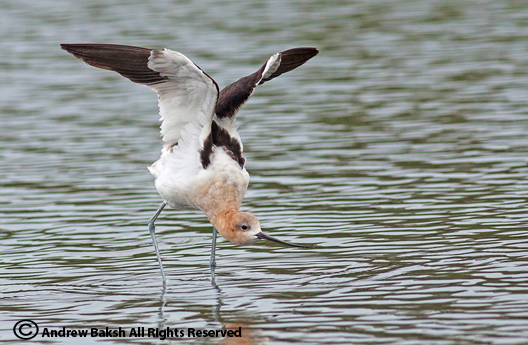 What is better than seeing and photographing an American Avocet on the East Pond at Jamaica Bay Wildlife Refuge in Queens NY? 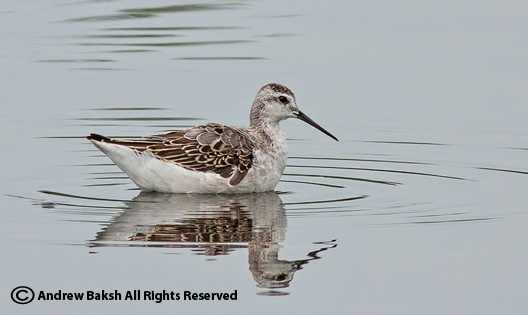 Why seeing and photographing the said Avocet AND a Wilson's Phalarope. 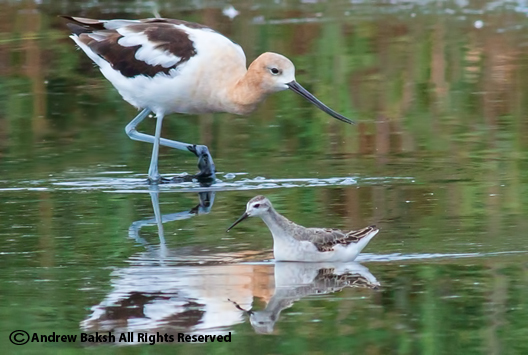 These two shorebirds are the current stars on the East Pond at Jamaica Bay Wildlife Refuge. It is a good thing these birds have shown up and stuck around for a few days because the shorebird numbers and variety on the East Pond has been paltry of late. 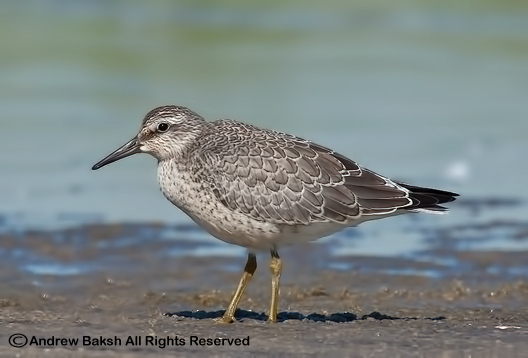 Black-belied Plovers are the most for one species type, followed by Short-billed Dowitchers. Stilt Sandpipers are all but gone with a handful still hanging around. 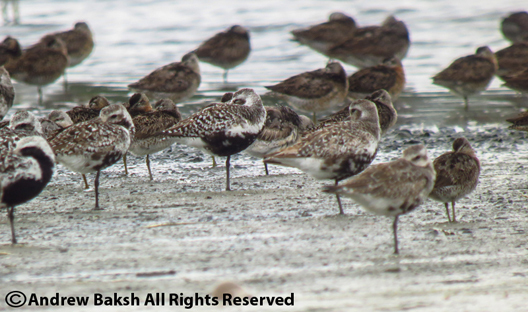 The occasional Red Knot helps with the variety but no Pectorals, Godwits or Western Sandpipers to be seen at least as of today. A few White-rumped Sandpipers are still around but the peep numbers have dropped significantly. Today, I noticed more juvenile Least Sandpipers than Semipalmated Sandpipers; something I had not seen before until today. With warm winds out of the south for the next couple of days, one could assume that the next few days will see very little turn over on the pond but I would be quite satisfied and happy with the common shorebirds as long as they show up! This morning, I did some birding at Breezy Point Queens, where I enjoyed a rather leisure time looking at a lot of our common shorebirds. I never get tired of looking at shorebirds and before you knew it, I had logged around 7 hours of study time. Most of my effort was focused on Semipalmated Plovers and Sanderlings. Some birders might understand my obsession with Semipalmated Plovers as they could understand I might be looking for the rare Common Ringed Plover. And they are right, I am a firm believer in understanding the common is a must before finding the uncommon. 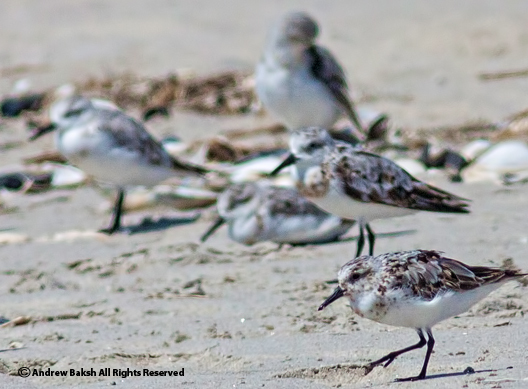 But what about Sanderlings? 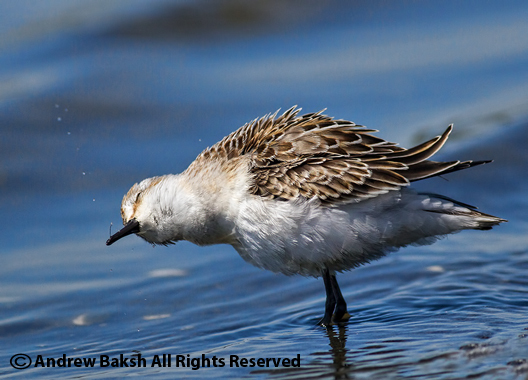 Well, I just happen to love Sanderlings. Wait, I say that about all the shorebirds. Okay, so what! Small Sanderling with a diminutive bill.